If you have followed the Amy in Austin blog for any amount of time, you will know that I love to pack lunch. A little over a year ago I came across the fabulous Easylunchboxes containers, and they became my inspiration for packing healthy lunches. Their original intent was for kids, and you can find blog after blog dedicated to adorable and creative "Bento" style lunches for children of all ages. Kelly Lester (the creator) has done a great job of fostering this community through multiple social media channels. While I may not have kids, I'm all about having something appealing to eat. I usually pimp out my own lunches on social media in an effort to foster growth around grown-up lunches. But the truth is I often pack lunches for Hank, too. Since we each have different preferences for food, and certainly different needs for calorie consumption, our lunches aren't always the same. 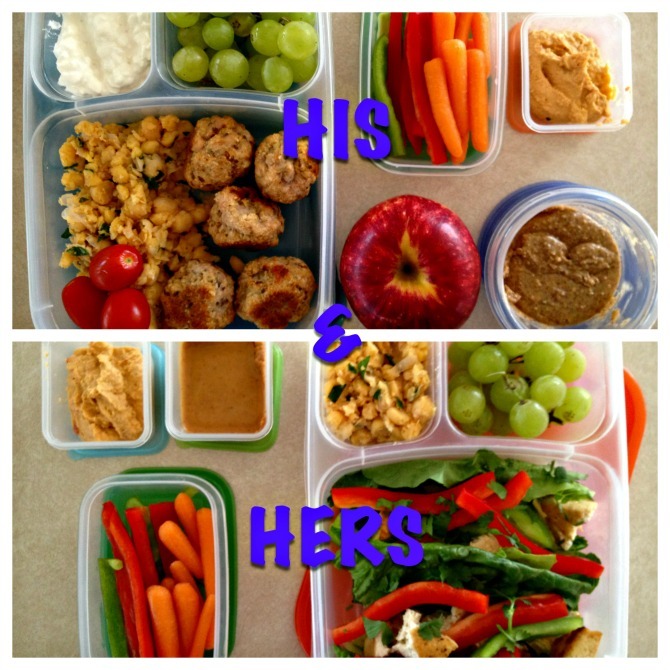 I thought it would be fun to compare what I send with him, along with a typical lunch for me. Boys gotta eat too! And since we're both trying to stay on the fit & healthy wagon, it eliminates most opportunities for making bad choices at lunch time. I recently got a copy of the lovely Smitten Kitchen Cookbook, and was eager to try out a few new recipes. As I flipped through and saw a recipe for Spiced Turkey Meatballs, I knew I had found a winner for Hank. Since I don't eat much meat- he doesn't get to eat much meat. But these were the perfect things to make and pack for him throughout the week, and he loves them! I also made Curried Chicken Salad, along with a Cucumber Dill Cabbage Slaw from Smitten Kitchen, and the Smashed Chickpea Salad that she paired with the meatballs in her book. We had an abundance of food, to say the least. *Think ahead. Plan easy dinners with enough to eat the next day. Use leftover meat/tofu to make things like lettuce wraps, use as salad toppings or on a sandwich. *Choose at least one dish that will keep for the week and will make several lunches (or freeze half for later). *Cut veggies and fruit for easy access throughout the week. *Pack lunch the night before, so that running late can't be your excuse.